Just because it is summer, doesn’t mean kids should stop learning. Remember learning can be fun – the more creative you are, the more fun it can be! Sometimes they won’t even know they are ‘learning’ in the process! That’s the best kind, right? Start the summer with a plan – Have each kid make a to do list of what he/she wants to do. This will help generate ideas and interest that your kids have. If your child is too young, have them draw pictures of what they want to do over the summer. Then talk about it (building communication and expressing ideas). Carryover of skills from therapy sessions! At home games to play…. Make bubbles – follow a recipe to make big bubble fun! Go to the grocery store and have your child write down the list of items and categorize the items such as “fruit, produce, breakfast foods, snacks, freezer items etc.”. Go to the pool and incorporate learning there with cool water toys – for young kids, work on counting, numbers, colors, following directions. 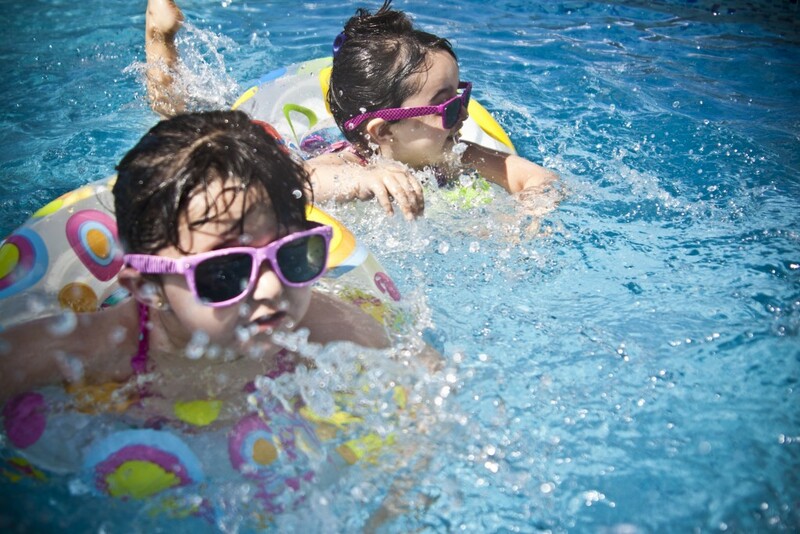 At the pool play a game where they copy each other’s moves in a sequence – works on following directions, recall, and memory! Teach the value of money and have a lemonade stand – Have kids use their OWN money (or discuss borrowing) to get it started – what is needed. (cups, lemonade, ice, containers etc). Earn money in the process and then discuss “paying back” money that was borrowed and what it means to save. Discuss the breakdown of donation/saving/spending. Start a garden and work on responsibility and enjoy the fruits of your labor at the end! If you are on a road trip – make it fun! However, hold back and ease into your ideas/rewards. Don’t flood kids with everything all at once. You want your creativity to last the duration! Address behavior and how items can be earned OR taken away if disagreements or fights ensue. ABC license plate game – look for letters on signs and license plates from A to Z! I spy – work on adjectives, naming objects, and word combinations. You could also talk about actions and articulation of specific sounds while taking turns! Write a letter to a long distance family member or friend. Write on paper!! Nothing better than receiving a handwritten note. Discuss the envelope and Post Office Process. Read a book – write a summary – create a short story with illustrations. If your child is younger, draw pictures to reflect different parts of a story/favorite part and then talk about it. Listen to a book on tape. Pause and ask questions – make predictions. Challenge each other to answering word problems or solve puzzles. Be creative and draw a map of where you are going and what you will do. Make landmarks on the map and create a “key” so others know what is reflected on the map. Start a journal of the trip so you remember what you did each day. Create bingo boards of what you should look for along the way. Bring card games along with you to play that don’t require game pieces. Make your own passport or variation of where you went and what you did. Bring a map and connect dots on where you have stopped and visited. Check out this link (also listed below) for tips/tricks for traveling in the car as well as fun ways to incorporate games and printables that are available for you to add to your collection! Make sure that home tasks and chores are accomplished before they run to get their screen time in. Take advantage of the weather and encourage them to be outside – ride bikes, climb trees, play games and create memories. Other resources and links to more suggestions to different activities!